Original Editors - Brittney Kerchief from Bellarmine University's Pathophysiology of Complex Patient Problems project. 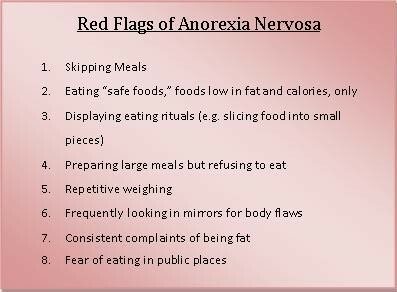 Anorexia nervosa is an eating disorder in which the individual exhibits severe weight loss without any indication of underlying systemic causes. Individuals with anorexia nervosa have a distorted view of their own body image and an extreme fear of gaining weight. Anorexia nervosa is diagnosed according to the DSM IV criteria listed below. "Intense fear of gaining weight or becoming fat, even though under weight." "Disturbance in the way one's body weight or shape are experienced, undue influence of body weight or shape on self evaluation,or denial of the seriousness of the current low body weight." "Amenorrhea (at least three consecutive cycles) in postmenarchial girls and women. Amenorrhea is defined as periods occuring only following hormone (e.g., estrogen) administration." Individuals with anorexia nervosa typically are young girls or women a part of the middle to upper-class families. Males also suffer from anorexia nervosa, but the prevalence is much lower, 5-10% of cases. The female to male ratios range from 6:1 to 10:1 in the United States. However, the characteristics and behaviors of males and females with anorexia nervosa are similar. 0.9% of American women suffer from anorexia in their lifetime. The following characteristics can be present in individuals with anorexia nervosa, however not all signs and symptoms may be present at the same time in one individual. Death is the most devastating co-morbidity present with this eating disorder and most commonly occurs due to symptoms of starvation or suicide. Medical conditions typically causing death consist of abnormal heart rhythms and imbalances of electrolytes. Mortality rates are as high as 5.9% in anorexia nervosa diagnoses. Anemia, mitral valve prolapse, osteoporosis, and stress fractures are examples of co-morbidities that may be present with any eating disorders. Many individuals with anorexia nervosa often develop other types of eating disorders as well. Up to 50% of individuals with anorexia nervosa develop characteristics of bulimia nervosa over the span of their lifetime. Antidepressant drug amitriptyline: Evidenced positive results when used at 175mg in RCTs. Medical examination (Most Sensitive examination): diet, nutrition, body mass index, weight fluctuations, exercise habits, and menstrual history. Physical examination of the patient's height, weight, vitals, skin and nail observation, auscultation of heart and lung sounds, and abdominal palpation must be completed routinely throughout treatment. Biological: Young women and men are at an increased risk to develop anorexia nervosa if the individual has a biological sibling or mother with anorexia nervosa. According to current research, children of patients with anorexia nervosa have a tenfold increased risk for developing the eating disorder. An area on chromosome one has also been associated with increased risk for development of anorexia nervosa. Varying amounts of the chemical serotonin have shown evidence in playing a role in anorexia nervosa. All of the above show a definite genetic involvement in patients with anorexia nervosa. Genetics: 50-80% of the risk for anorexia and bulimia is genetic. According to research, families in which the condition is reported in more than one member, a genetic predisposition to AN may be a factor for the development of anorexia. Although the gene(s) responsible for the disorder have not yet been identified, research has shown that certain loci on chromosomes 1, 2, and 13 may be involved in the development of Anorexia. Recently, a study using targeted sequencing implicated the gene epoxide hydrolase 2 as increasing the risk of developing anorexia. Psychological: Individuals with anorexia nervosa often portray low self-esteem, low self-confidence, extreme perfectionist qualities, and obsessive-compulsive behaviors. Higher rates of eating disorders are also found in individuals who were teased about their weight at a younger age. Strict weight control can be used as a means to combat feelings of inadequacy or identity confusion. Sociocultural: A correlation between prevalence rates of anorexia nervosa and modern western cultures have been evidenced in research today. Modern western cultures are theorized to emphasize importance of thin appearance and associate power or wealth with thinness. Adolescents who feel pressure from families or peers to appear unrealistically thin are at an increased risk for developing anorexia nervosa. Clients with anorexia nervosa can be treated in outpatient or inpatient facilities, however the approach is similar in both instances. Hospitalization may be required for individuals who are not medically stable. A more restrictive approach may be more beneficial for individuals who continue to refuse to eat orally, decline in weight despite supplementation, electrolyte imbalance, heart arrythmias, or unresponsive to previous treatment. The main goals for treatment of anorexia nervosa include patient's recognition of eating disorder, identification of triggers, improvement of delusional thoughts and feelings towards body image and shape, achievement and maintenance of healthy weight, and preventing relapse. A multi-focal approach is taken for the medical management of anorexia nervosa in order to combat all symptoms manifested within this disorder. Behavioral therapy, psychotherapy, family couseling, dietary and nutritional counseling, and exercise guidance are all recommended in combination to treat anorexia nervosa. Pharmocological treatment is another aspect that may be necessary in the treatment of the depressive sypmtoms found with anorexia nervosa (see medications listed above). Cognitive behavioral therapy (CBT) is the most commonly used and effective psychotherapy to treat this eating disorder especially when initially supportive and directive. For younger individuals with anorexia nervosa, family based therapy is recommended. However, family based therapy does not show positive results in individuals whose family shows high levels of expressed emotions. Family based therapy focuses on resolving any internal conflicts, monitoring the patient's food intake, and preventing relapse. These individuals, as well as individuals over 18 years old or with a longer duration of anorexia nervosa, benefit more from individual based psychotherapy. Twelve-step programs can also be successful with this population in preventing relapse. Physical Therapy is an integral part in rehabilitation of patients with anorexia nervosa once stretching and exercise is reintroduced. A health care provider who has extensive knowledge of proper exercise guidelines and how to monitor physical signs of fatigue and vitals is needed to treat these patients. These skills are important to help the patient learn to monitor levels of fatigue and heart rate in order to prevent them from over exercising or exercising to the point of exhaustion. Patients with anorexia nervosa are also more susceptible to orthostatic hypotension, bradycardia, and muscle cramping due to malnutrition and low level caloric diets. A health care provider, such as a physical therapist, is the best trained professional to monitor and respond to these medical conditions. A physical therapist can also be beneficial during the screening process because they are educated in their professional programs on how to recognize the signs and symptoms of this disorder. A therapist may be the first provider to notice signs and symptoms present with this disorder. For example, during a cervical exam the therapist may note edema in the face or salivary glands or overuse injuries like stress fractures from excessively exercising. Mitsuaki Tokumura, Shigeki Yoshiba, Tetsuya Tanaka, Seiichiro Nanri, Hisako Watanabe. Prescribed exercise training improves exercise capacity of convalescent children and adolescents with anorexia nervosa. European Journal of Pediatrics [serial online]. 2003;162:430-1. Available from: ProQuest Health and Medical Complete. Accessed April 8, 2010, Document ID: 1322842551. ↑ 1.0 1.1 1.2 1.3 1.4 1.5 1.6 1.7 Bond C, Bonci L, Granger L, et al. National Athletic Trainers' Association Position Statement: Preventing, Detecting, and Managing Disordered Eating in Athletes. Journal of Athletic Training [serial online]. January 2008;43(1):80-108. Available from: Teacher Reference Center, Ipswich, MA. Accessed February 12, 2010. ↑ 2.00 2.01 2.02 2.03 2.04 2.05 2.06 2.07 2.08 2.09 2.10 2.11 2.12 2.13 2.14 2.15 2.16 Mitchell, James E. Outpatient Treatment of Eating Disorders: A Guide for Therapists, Dietitians, and Physicians. Minneapolis, MN, USA: University of Minnesota Press. 2001. p 14-27. ↑ 3.0 3.1 3.2 3.3 3.4 3.5 3.6 3.7 3.8 Mayo Clinic Staff. Anorexia Nervosa. Mayo Clinic Website. 2010. Available at: http://www.mayoclinic.com/health/anorexia/DS00606. Accessed February 20, 2010. ↑ 4.00 4.01 4.02 4.03 4.04 4.05 4.06 4.07 4.08 4.09 4.10 4.11 4.12 4.13 4.14 4.15 4.16 4.17 4.18 Franco, Kathleen N. Eating Disorders. Cleveland Clinic Center for Continuing Education Website. 2009. Available at: http://www.clevelandclinicmeded.com/medicalpubs/diseasemanagement/psychiatry-psychology/eating-disorders/. Accessed February 20, 2010. ↑ 5.0 5.1 5.2 5.3 5.4 5.5 5.6 5.7 5.8 5.9 Goodman, Catherine C. and Fuller, Kenda S. Pathology: Implications for the Physical Therapist. St. Louis, Missouri: Saunders Elsevier; 2009. ↑ 7.0 7.1 Arcelus, J., Mitchell, A. J., Wales, J., & Nielsen, S. (2011). Mortality rates in patients with anorexia nervosa and other eating disorders: a meta-analysis of 36 studies. Archives of General Psychiatry, 68(7), 724-731. ↑ Ulfvebrand, S., Birgegard, A., Norring, C., Hogdahl, L., & von Hausswolff-Juhlin, Y. (2015). Psychiatric comorbidity in women and men with eating disorders results from a large clinical database. Psychiatry Research, 230(2), 294-299. ↑ 9.0 9.1 Trace, S. E., Baker, J. H., Peñas-Lledó, E., & Bulik, C. M. (2013). The genetics of eating disorders. Annual Review of Clinical Psychology, 9, 589-620. ↑ Effects of Anorexia Nervosa. Women's Health Zone. Available at: http://www.womenshealthzone.net/eating-disorders/anorexia-nervosa/effects/. ↑ Poutanen O., et al. Severe anorexia nervosa, co-occurring major depressive disorder and electroconvulsive therapy as maintenance treatment: a case report. Cases Journal [serial online]. 2009;2:9362. Available at: http://www.ncbi.nlm.nih.gov/pmc/articles/PMC2804009/?tool=pubmed. ↑ Douglass L. Yoga as an intervention in the treatment of eating disorders: does it help. Eat Disord. 2009 Mar-Apr;17(2):126-39.